These custom 2 x 1.88 small heart shape refrigerator magnets – 20 Mil are perfect for promoting physician offices, healthcare supplies and healthcare initiatives. This magnetic fridge token is lovingly retained over refrigerator doors in homes due to its inspiring shape. Whether you are organizing a charity event or have won a contract for supplying at the medical conference, this heart shape refrigerator magnet makes a perfect giveaway. 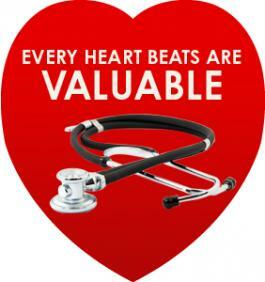 We offer great price savings on bulk orders of this heart shape refrigerator magnet. Request a quote to know wholesale discounts that you can expect on bulk ordering these customized 2 x 1.88 small heart shape refrigerator magnets – 20 Mil. Imprint area – 2" x 1.88". Imprint Methods – Four Color Process, Full Color Process & Silkscreen. Imprint Colors - Burgundy, Black, Gray, Brown, dark blue-navy, Dark Green, Light Blue, Green, Medium Blue, Medium Pink, Pink, Orange, Purple, Red, Tan, Teal & Yellow. Product Size : 2 in. x 1.88 in.